One of the internet's most beloved astronauts is stepping down from the Canadian Space Agency, bringing a decades-long career to a close. Of all the astronauts helping make the world a more awesome place, Commander Chris Hadfield is among the most recognizable. Stationed with NASA by the Canadian Space Agency, Hadfield recently attracted worldwide attention while using social media from the International Space Station. 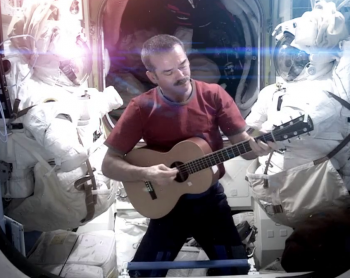 Whether conducting experiments on the nature of space physics, or playing the guitar with professional musicians, Hadfield captivated the entire internet while making space travel exciting for the general public. Sadly, all good things must come to an end: Hadfield recently announced that as of July 3rd, he will be retiring from the CSA and bringing his decades-long space career to a satisfying close. "I've had such an interesting career and after 35 years it's time to step down," Hadfield told reporters at Montreal's Canadian Space Agency headquarters. "I'm the last astronaut of my class that's still around." Hadfield hasn't fully decided what to do next, but he does intend to give presentations about his space travels over the coming year. He'll also be pursing private, non-government interests, and taking some time to recover his physical strength after months of living on the ISS. Among his top priorities is a return his native Canada, having lived in Houston, Texas when he wasn't in a gravity-free environment. "[I'll be] making good on a promise I made my wife nearly 30 years ago - that yes, eventually, we would be moving back to Canada," Hadfield said. "I'm looking forward to the next phase of life." Although Hadfield is stepping down, he seems to have strong hopes for the future of the agency. "There are so many young astronauts in the program," Hadfield commented. "I would be an obstacle for them." Personally, I think that comment just provides more evidence of how Commander Hadfield was one of the classiest gents in space. Here's wishing him all the best in whatever he does next.